Roxanne Kucera Sachs grew up surrounded by art. Her grandfather was a highly regarded architect and the walls of his home were filled with paintings by the early California impressionists, as well as his own drawings. Roxanne loved to draw and paint from an early age—her talent earned her a scholarship to attend the Art Center School of Design in Los Angeles as a high school student. After graduating, she continued her education at Fullerton College, then transferred to the University of California at Riverside, where she received a degree in Fine Art and a teaching credential. For the next twenty years she pursued a very fulfilling career teaching art and general education to elementary and secondary students. Roxanne was a gifted teacher, but she had little time to pursue her true vocation. 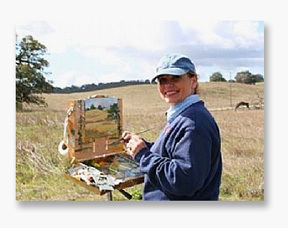 Now a full-time artist, Roxanne enjoys painting en plein air in scenic locations throughout central California. With a beautifully balanced palette and a delicate sense of composition, her lovely oil paintings stand out from the crowd of local artists with a superior style and execution.